December 12, 2018 – Oxford Direct Services (ODS) has secured a two-year extension, worth up to £400,000, to its recycling and waste management contract with Oxford Brookes University. The contract extension comes after an initial three-year period where ODS worked hand-in-hand with the university to raise recycling rates from just under 58% to the current recycling rate of 71%. Oxford Brookes University has the ambitious goal of recycling 75% of its waste by 2020. The Oxford Brookes University Environmental Services Team and ODS has implemented a wide range of initiatives to improve recycling rates. Initial quick wins included standardising the colour coding of all 1,100 litre bins and recycling receptacles across the halls of residence to make it easier for staff and students to recognise the correct types of waste to deposit in each bin. All new halls of residence students are delivered a welcome pack explaining the re-use and recycling programs operating from the halls. The welcome pack is backed up by door knocking, posters and staff training to ensure everyone is aware of the recycling goals and the ever improving recycling options offered by ODS. The ODS recycling education team, working with the University’s Community Engagement Team, also takes information and provides training to students living in shared housing off campus around the City. They also attend the Freshers’ Fair and events throughout the year to promote the recycling efforts and promote new initiatives, such as cup recycling. 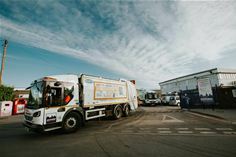 Educational tours to recycling centres, energy recovery and anaerobic digestion facilities have also been popular activities to raise awareness and help educate staff and students. The University also runs a variety of ‘end of year’ campaigns to encourage students to reduce waste by taking items home with them at the end of the year or donating any unwanted items. This year ODS provided additional special waste metal containers for students to recycle unwanted goods at the end of year. The university also works in partnership with the British Heart Foundation, who have all year-round donation bins as well as extra bins during the end of year campaign. All dried food is donated to the Oxford Food bank. This year, ODS will transport almost 900 tonnes of waste for recycling and incineration. All waste is processed for recycling or incineration within the County and transport journeys have been minimised by the provision of waste compactors on the university campus, with the resulting reduction in carbon footprint. The efforts of the university and ODS have resulted in Oxford Brookes reaching a 71% recycling rate this year, putting it in the top third of further education facilities for recycling, according to official data from the Higher Education Statistics Agency. Founded in 2012, Oxford Direct Services is now a social enterprise wholly owned by Oxford City Council. Employing over 700 staff, ODS serves Oxford City Council – its largest customer – providing services to residents and businesses to keep the city running day and night. In addition, ODS serves a large number of businesses, schools, universities and other organisations in and around Oxford. ODS provides a range of services in the following areas: recycling and waste management, highways and engineering, construction and motor transport along with pest control, landscaping and ground maintenance. All ODS’ profits are returned to Oxford City Council to help fund public services.